Move over, iPhone 6, iPhone 6 Plus, and even Samsung Galaxy Note 4. The new king of DxOMark is the Samsung Galaxy S6 edge – and, by extension, the Galaxy S6, since these two handsets share the same camera and internals (except the screen). Today DxOMark has published the results of its testing of Samsung’s newest flagship and, more specifically, its camera. The S6 edge got an overall score of 86. 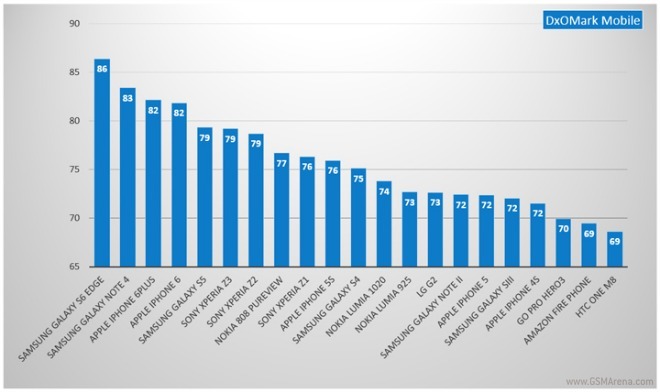 That makes it the best performing smartphone camera ever tested by DxOMark. For comparison, the Galaxy Note 4 got 83 points, while the two newest iPhones both have 82. The Galaxy S6 represents a jump of 7 points from its predecessor, the Galaxy S5, which scored just 79. The S6′s overall score is a combination of its result for photo taking, which is 88, and the one for video capture, namely 84. This means it’s a little bit better for pictures than for videos, but both individual scores are still ahead of competing smartphones. For photos, the Galaxy S6′s camera achieves very fine detail and low noise levels in bright light, good exposure, fast autofocus, good white balance, decent levels of detail preserved in low-light shots, as well as excellent flash results. On the other hand, noise is present in low-light captures, slight color fringing is noticeable, and mixing the use of the flash with tungsten lighting results in a white balance that’s a bit off. For video capture, the smartphone’s snapper exposes fine detail when shooting in both bright and low light, also showing little noise. Exposure is good, as is the white balance and the color. But not everything is perfect: a slight flare is present when taking videos in bright lighting, as is some color shading when shooting in low light.